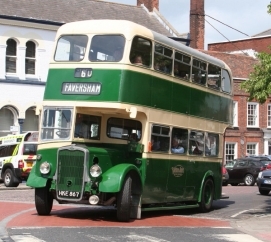 On behalf of its owners, the Club manages and maintains former Maidstone & District vehicle DH159 (HKE 867), a 1945 Bristol K6A rebodied in 1953 with Weymann H30/26R bodywork and acquired by the Club in 1967. After major restoration work since 2009 it now takes part in several local rallies and running days each season. In 2013, its appearances included Detling, Faversham, Eridge, Herne Bay and New Romney. For an opportunity to ride on it in the current season, please check our Events page.